Annelies's roommate, Kirk, has two lovely kittens named Zelda (the brown one) and Daphne (the orange one). 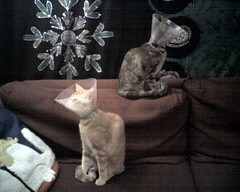 They just got spayed, so they have to wear collars for a few days so they won't pick at their stitches. So, I took the opportunity to take some pictures of their cuteness. When I first glanced at the picture I thought for a moment that these were stereo speakers shaped like cats.